Jejune's Place: Please welcome Lara! 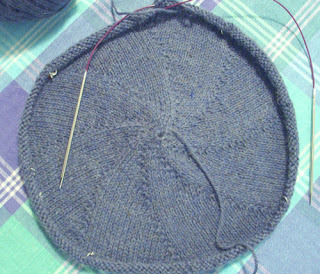 And here is what this Bendigo Alpaca is now becoming... the Lara Pinwheel Sweater from Elann... really loving it. Easy, interesting enough, and growing quickly (at this stage at least). ETA : I'm testing these puzzles, as a Technical Reviewer, not writing them from scratch ... so I have to do each puzzle, while considering how hard /easy/fair it is, suggest improvements, and make corrections and so on. Plus make 'expert comments' on the text of the book. That's looking really good, gosh that's another thing to add to my queue!! Glad you found the perfect pattern finally! 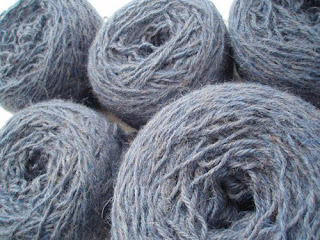 The yarn looks similar in color to that which is illustrated in your artwork on the side of your blog (with the lace and wine). Have a fine time knitting away and may your new piece fit you to a T! Oh the pinwheel is a perfect choice for alpacca! Good on you! 350 puzzles in three weeks - my god! Are you making or solving them? Either way, I am in awe! Lovely. It's a great choice and fascinating construction! I shall have a look this morning when I come over! You sure have done a lot of ripping and winding it back up. It really is coming along. Love the color of the yarn. Go back over to my blog and look at the two videos I just posted. NOW I've got a bad case of startitis after looking at that pattern. It's going to be gorgeous. I love crossword puzzles but I'm not sure I could edit/write them for a living. I am always amazed at how well the words flow from one another and into each other. Finishing a good crossword is very satisfying.